The LWML (Lutheran Women’s Missionary League) supports the work of Christ Lutheran under the focus of missions and service through their special “Mite Box” gifts and service projects. They have been active in Christ Lutheran Church for over fifty years. This group usually meets the second Saturday of every month at 10am. They sponsor a seminary student with prayers and $50.00 a month until he graduates. A bake sale is held the third Sunday of the month after the 8:00 a.m. service, with profits going to their treasury or mites. They are also members of the National LWML. A convention is held every 2 years, usually in June. In 2002, the convention was in Oklahoma City and in 2004, it will be in Jacksonville, Florida. Some members usually plan to attend these conventions. 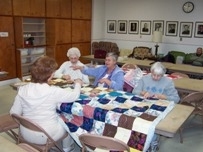 About 8 ladies meet twice a month to make “tied” quilts for Lutheran World Relief. School kits and health kits are given to Lutheran World Relief. All ladies of the church are eligible to be a member.